Shoes are such a big deal when you’re traveling–they can make or break your vacation. One blister while you’re walking around Rome, and you’ll wish you had brought any other pair of shoes than the ones on your feet. I put out a poll on Facebook, and you blew me away with your suggestions. Crowd sourcing for the win! Here’s a round up of your favorite comfortable, stylish travel shoes. All of you outdoorsy types go crazy for Chaco sandals. They offer killer arch support, and easily go from backpacking Europe to hiking the Appalachian Trail. Crocs have come a long way from their beginnings as foam slip-ons! Now, they’re comfortable AND cute. Plus, they’re made to get wet, so getting caught in the rain won’t ruin your day. For a classic pair of flip flops to take from the beach to a dressy dinner, check out these Rainbow Flip Flops. Break them in, and you’ll be set! Birkenstocks. They’re a classic style, they’re comfortable, they pack well. ’nuff said. If you plan to walk a lot, but don’t want to wear your running shoes, check out Sketcher’s slip-ons. They’re supportive and fit like a tennis shoe, but are more stylish than their running shoe buddies. I love my KEEN sneaks for the exact same reason! And of course….Toms! They’re comfy, they slip on, and they pack well. Check out Danskos. Nurses love them for good reason. They’re a bit pricey, but if you like the look, it’s a worthy investment. A classic pair of flats is never a miss. For other ballet flat recommendations, check out Steve Maddens, Dr. Scholls, Patagonia, or Nine West. 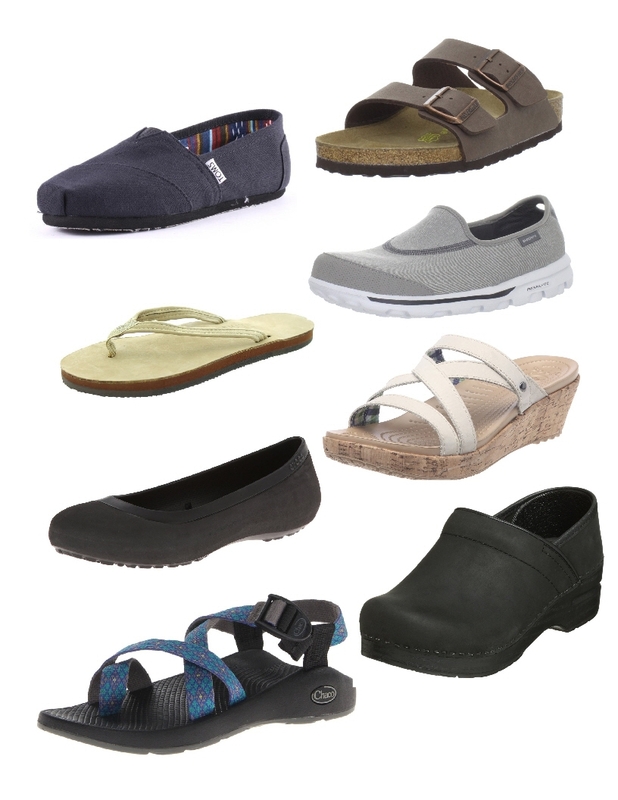 Images via Amazon, right to left: Toms, Birkenstocks, Rainbows, Sketchers, Crocs Flats, Crocs sandals, Chacos, and Danskos. Some links in this post are affiliate, which means I will get a small commission if you choose to make a purchase. Thanks for supporting Balance and Blueberries! If you’re interested….how to have the best vacation and tips for your next (first!?) camping trip. What shoes do you love to travel in?